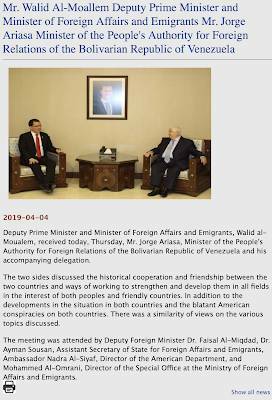 On April 4, 2019, Syria's much beleaguered President Bashar al-Assad met with Venezuela's Foreign Minister Jorge Arreaza in Damascus. According to SANA (the Syrian Arab News Agency), the two gentlemen discussed issues facing both nations, particularly how the West and the United States was meddling in their nations. 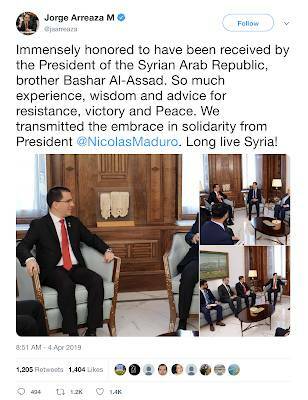 Mr. Arreaza's meeting with Bashar al-Assad followed a meeting in Beirut with Hezbollah leader Hassan Nasrallah and Lebanese Prime Minister Saad Hariri. "3. All Members shall settle their international disputes by peaceful means in such a manner that international peace and security, and justice, are not endangered. 4. All Members shall refrain in their international relations from the threat or use of force against the territorial integrity or political independence of any state, or in any other manner inconsistent with the Purposes of the United Nations." The Bolivarian Republic of Venezuela categorically rejects the Donald Trump’s government intention of recognizing Israel’s full sovereignty over the Syrian territory of Golan Heights, currently under Israeli military occupation, in violation of UN Security Council resolutions and disregarding the principles enshrined in the United Nations Charter and international law. As if harm and destruction created over the past decades in the Middle East by the United States governments were not enough; Donald Trump seeks to continue destabilizing the region by assaulting the sovereignty, integrity and security of the Syrian people, whose displacement by Israel has been condemned by the international community. Through these actions, once again, the U.S. government mocks international law, multilateralism and peace, and attempts to conceal the criminal policy of the State of Israel. 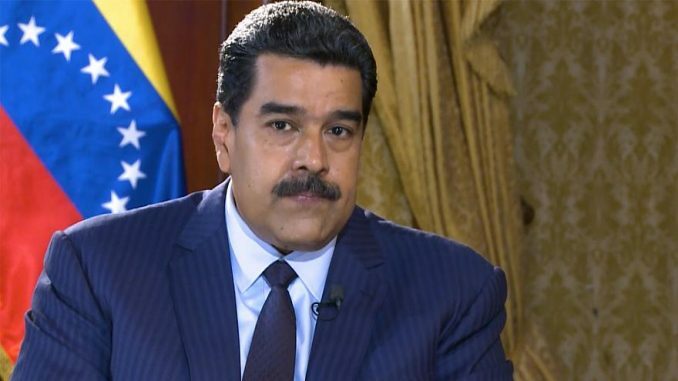 Venezuela reiterates its conviction that the defense of peace and strict adherence to international law should be the only acceptable formula to solve conflicts, and condemns the irresponsible and blatant Trump’s administration attempts of inciting more violence and confrontation. The Bolivarian Republic of Venezuela reiterates its support and solidarity with the People and government of the Syrian Arab Republic in its call for an end to the illegal Israeli occupation of the Golan Heights territories." Isn't it interesting how Washington's global nation rebuilding agenda drives nations that would otherwise have little in common into each other's "arms"? Venezuela and Syria may be world's apart when it comes to culture but the actions of the United States have driven them together. 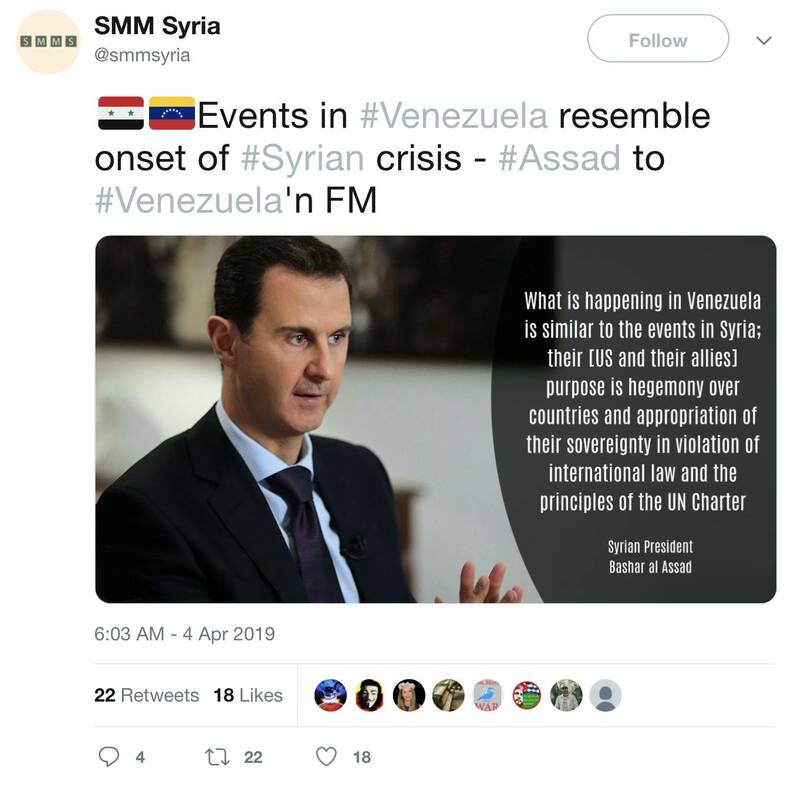 At the very least, it appears that the current civil unrest in Venezuela is following the pattern set by Syria back in 2011 and that it is part of America's new template for starting a regional war which will allow it to meet its global hegemonic agenda.